I've been at Bungie seven months now. For those of you who don't know, Destiny 2 is due to hit store shelves in September. That means Mama is working a lot to help ship this game. A LOT. 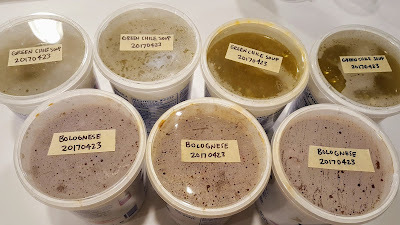 I still do the bulk of the grocery shopping and weekend meals, so I try to make at least one weekend meal a Freezer Meal. That means I make a big ol' batch of something—mostly soups, stews, and sauces—so we have enough for dinner that evening and extra to freeze. Sometimes it takes me half a day to cook so much, but it's hard to beat an economy of scale that produces multiple meals. An inadvertent tableau that aptly depicts our life at the moment. I call it Both Parents Crunching. Below are links to recipes I've shared on this blog before. They are all family favorites (i.e. 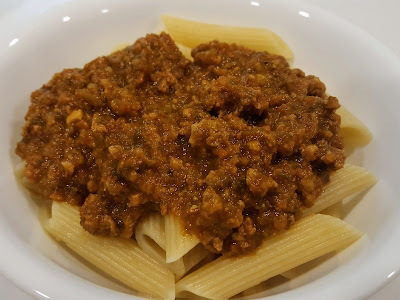 almost 80% guaranteed that the kids will actually eat it) and they are fantastic freezer meals. Pro Tip: Save large plastic containers with clear lids to store your meals. Make sure to label them clearly with the name and date of cooking. 1) Kalua Pork—Freeze the pork in containers big enough to hold however many servings you want per meal. If you put cabbage in your kalua pork, I recommend freezing the pork sans cabbage. Frozen cabbage gets all soggy and gross. You have to plan ahead a little to have these leftovers; the night before you want to have this dinner, put a container in the fridge to thaw overnight. Heat the pork on the stove or in the microwave until it's hot. If you want, you can blanch some cabbage to add to the kalua pork after it's heated. Make some rice and salad and you've got dinner. 2) Tinolang Manok (Pilipino chicken soup)—You don't even need to thaw it out before reheating. When you take the container out of the freezer, run it under a hot tap to loosen the sides. Then just wiggle the frozen block out of the container into a saucepan and heat it. Boil for two minutes to make sure the chicken broth is bacteria-free. Make some rice and you've got dinner. 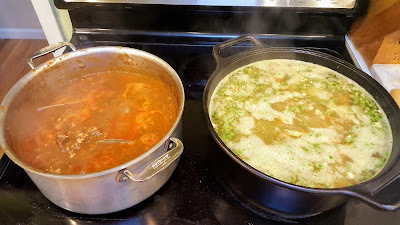 3) Green Chile Soup—As with the Tinolang Manok, you can just chuck the frozen block o' soup into a saucepan and bring it to a boil to kill any nasties. Heat some tortillas and you've got dinner. If you're feeling extra fancy, you can cube up some avocado. Dot the soup with avocado chunks so you get a little creamy avocado bite with each spoonful. Yum! 4) Lamb and Lentil Stew—This may be our favorite freezer meal; it's delicious when it's fresh, but somehow the flavors just get better as it mellows out. Again, no need to thaw the stew beforehand; just heat up the frozen block in a saucepan. If it looks like it's too thick or you want to stretch the meal a little, add a cup or two of water as it is heating. Brown meat in a little olive oil, then take it out of the pan. Add onions to pan and sauté on medium heat until soft. Add garlic to pan and sauté for 1 minute. Add vegetables and sauté for 5 minutes or until soft. Add tomato sauce and 1 can of water. Using a hand blender, wazz up the vegetables and tomato sauce until veggies are nondescript tiny dots of green. If you don't have a hand blender, spoon out the sauce and veggies into a food processor or blender and wazz it up there. Add meat back into pan and stir. Add tomato paste and pesto, then 1-3 tomato sauce cans of water to desired consistency. If you don't have pesto, add basil and oregano. Add 1 bay leaf and simmer on low heat, uncovered, for about 30 minutes to thicken or until it has cooked down to your desired consistency. Serve over pasta (my girls like penne best) or spaghetti squash. You can also put it on rolls for sloppy joes. There you go. I hope you eat a lot of yogurt like we do and that you saved all the containers. You have some cookin' and freezin' to do this weekend. *He may be a superior maid, but I'm still the best nanny. **Shoutout to Diana, who helped me type up this recipe. ***I keep a Ziploc bag in the freezer and chuck green veggies in there that I won't have time to cook before they go bad. When it's time to make sauce, I empty that bag into the pot. Waste not, want not. Yesterday, my family and I bid him farewell. It's hard to capture in a three-minute speech everything my father was to me, but here is what I said to a chapel full of family and friends who loved my dad. 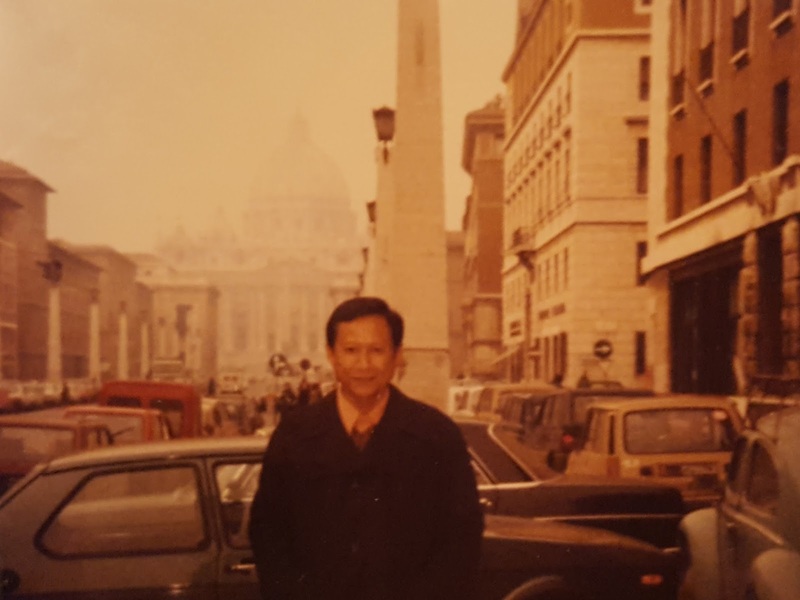 When I was about six or seven years old, my dad got a chance to travel to Europe for business. Somewhere on one of these poster boards, there’s a grainy photo of him wearing a winter coat, posing in front of the Vatican. I remember thinking how novel and exotic it was to wear a coat. Daddy looked so cool — like an American in the movies! Like an American in the movies! He brought home the most wonderful pasalubong for me from that trip — a collection of dolls, one from each city he had visited. Each doll was dressed in national costume, and had different-colored skin, hair, and eyes than me. Through those dolls, my dad was showing me that there’s a world outside the Philippines, full of different, beautiful people. 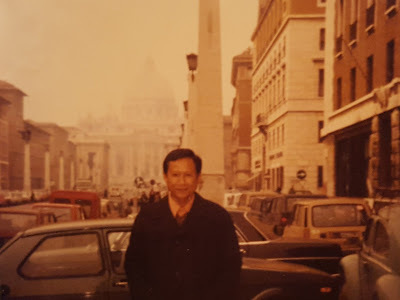 That pasalubong sparked a lifelong wanderlust, and I became determined to travel to the places my dad described in his stories. Somewhere in my photo albums, there’s a photo of me wearing a winter coat, posing in front of the Vatican. I don’t look as cool as my dad did in his photo. Totally getting away with something. I miss arguing with him about politics and the state of the world. Dad and I were both Sagittarius, born in the year of the Tiger, just 36 years apart. And when two fire signs argue, honey, it is a FIGHT! But even when we argued, I got the sense that he was trying to learn something, to figure out how he could become a better person from this fight, from any fight. I’d like to think I got that same drive to become a better person. My dad thought deeply about things, and almost until the end of his life, he was still learning and growing. Much of who I am is a reflection of my dad. I inherited his adventurous wanderlust, his insatiable curiosity, his ambitious determination, and his irreverent sense of humor. When someone we love dies, our natural coping instinct is to elevate our beloved to sainthood. 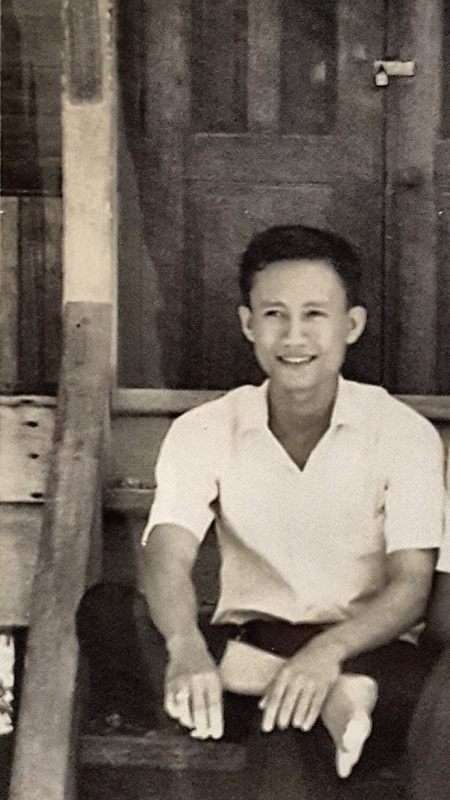 My dad was a lot of things, but he was no saint. Nah. I mean, just look at this cool cat. My dad was a force of nature. He had the energy of a Signal 5 typhoon, the warmth of the sun over Manila Bay, and the hidden depth of the Pacific Ocean. He laughed and learned and loved and lived out loud, inviting the entire world into his big, open heart. Thank you, Daddy, for helping to bring me into this world, showing me how wide and wonderful it is, and encouraging me to go out into it. I will strive to keep my heart as open as yours was. I will keep laughing, learning, loving, and living out loud. Maybe someday, I will grow up to be just like you. I love you. Dear Girls: Keep Loving. Keep Fighting. 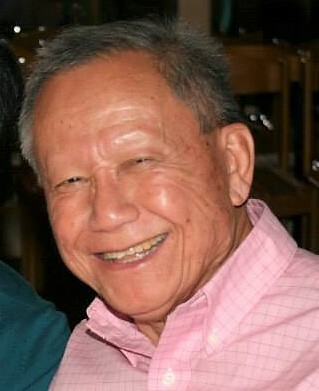 We’re in Baltimore to celebrate Lolo’s 78th birthday and have our second Thanksgiving meal in a week. We have a lot to be thankful for, this year and every year. We are all in excellent health. We have a warm, safe place to call home. We enjoy clean water and more than enough food. We love and are loved by our family and friends. Both of you are learning and doing amazing things at school, Daddy is pursuing his dream of developing an indie VR game, and I got an editor job after six years away from the game industry. But there are a few things that are not so great. Your grandfather is struggling with Lewy Body Disease, and for the last year, his condition has just gotten worse. You might be surprised to find that he’s no longer the silly, happy Lolo you remember sprawling on the floor and playing with you just a couple years ago. Lolo can’t get around very well on his own anymore and his speech is slurred. It has been tough for the rest of our Hiponia family in Baltimore, too, helping him live with this disease while also living their own busy lives and taking care of themselves. I’m glad we have this chance to spend some time with Lolo; I’m not sure how many more chances we will have. I’ve been struggling to keep this quote in front of me since the election, and focus on the work that needs to be done. On election night, when it became clear who our next President was going to be, Daddy and I were shocked, embarrassed, angry, scared, and sad. We were in a bad place. We thought about the truly amazing progress that President Barack Obama made during his administration and worried that it would all be undone. I still remember watching President Obama’s inauguration with Diana, who was only eight months old at the time. I was breastfeeding her on the couch in our living room in Edmonton, and as we watched President Obama being sworn in, I felt such pride and hope. I was excited to see the change that the next four years would bring to our country. President Obama is the only President you girls have ever known. All your lives, you’ve had a President who works and fights for the same things your parents believe in. The Affordable Care Act (or Obamacare) was a godsend for our family. It allowed Daddy to pursue his dream without worrying that he was putting our family’s healthcare in danger. Now that I have a full-time job again, we are covered with good healthcare benefits, but that’s not always the case with everyone we know. Uncle Jeremy ended up paying about $6000 for an emergency room visit and doctor follow-ups, and he has insurance through his job. For his sake and others’, I hope Obamacare is only made better rather than taken away. All your lives, you’ve heard from us that you can love and marry anyone you choose. Gender and sexuality are fluid and flexible, and love is love is love. Daddy and I happened to fall in love and marry each other, and our marriage looks like what most people think marriage looks like: a man and a woman. But it wasn’t so long ago that it was illegal for Daddy (a white man) and me (a woman of color) to marry. People realized that law wasn’t right so it changed. People and laws can change. Under President Obama, marriage equality became law in our country, and the weekend the law passed, we went to our first Pride parade as a family. It was important for all of us to be there to celebrate that love wins. Aloha always wins. Remember that, especially if/when the government thinks it can tell you who to love and marry. Keep loving. Keep fighting. Also remember that a woman—a girl—can be President someday, probably in your lifetime if not mine. You two were so excited that we might get our first woman President, and Daddy and I were, too. We let you stay up way past your bedtime to watch Hillary Clinton accept the nomination for President of the United States. Tala checked out about halfway through her speech, but before she fell asleep, the two of you built a LEGO set of what you were seeing on TV. 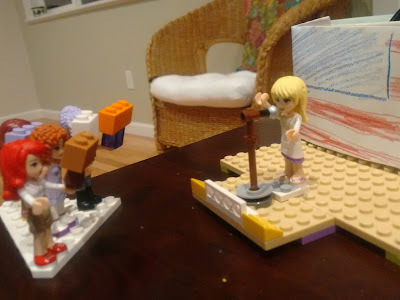 LEGO Hillary Clinton addresses the DNC. I don’t know if I have enough words to tell you how much my heart swelled with pride and hope that the two of you saw a strong, smart, capable, powerful person – who just happens to be a woman – speaking about working and fighting for the things she believes in. Daddy and I are so proud to watch you two growing into strong, smart, capable people – who just happen to be girls – and we know you will work and fight for the things you believe in. I have to admit that I’m a little anxious about the change that the next four years will bring to our country. We live in Washington state, among many people who share my and Daddy’s values and beliefs. We are mostly safe from the danger other people around our country are facing, all because of what they look like, where they come from, the people they love, or the things they believe. That doesn’t mean we’re safe from some of the big and small changes that will happen in our government, since it seems like they want to do everything different than what President Obama did. So we have to keep working and fighting for the things we believe in. To keep that goal in front of us, Daddy and I are setting up monthly recurring donations to organizations that reflect our values, like Planned Parenthood. They provide much-needed health services to people in our community who would otherwise not be able to get them, and they strongly support women’s reproductive rights. All your lives, you’ve heard from us that you—and only you—have the right to make choices about your body. I remember when Diana tried to use that to her advantage: “Why do I have to wash my hands for dinner? You said it’s my body and only I get to choose what to do with it.” Technically, you are correct, but the only exception is when you sit down to eat dinner at my table. Wash your filthy hands. But keep challenging anyone who tries to tell you what to do with your body. The next few days of our trip are going to present a few challenges. One of the things I used to be able to count on when I saw Lolo was a spirited debate about politics. It makes me really sad that it won’t happen this year, for many reasons. At the same time, I’m hoping that the conversation at dinner tonight (or any other night of our trip) will not break down into the grownups shouting about politics. Uncle Greg and I have very different viewpoints (that’s what we call the Understatement of the Year, kids), but he’s a decent and kind man and I want to understand where he’s coming from. I want to listen to him with my heart wide open. The next few years of all our lives are going to present a few huge challenges. On election night, I couldn’t even cry as so many people did, and I haven’t cried. It’s almost like the time I didn’t cry when my best friend in 7th grade died. If I don’t cry, maybe it didn’t really happen. But the election did happen, and now we have a lot of work to do. I haven’t even talked to you two about the fear that I carry in my heart, fear that only brown-skinned immigrants can really understand, fear that only women face every day. Listen when your heart pounds with fear; it’s trying to keep you alive. Always remember that fear can be transformed into a force for action, a force for change. Use the force for good. Your heart is a muscle the size of your fist. Keep loving. Keep fighting. Copyright Cookie Everman © 2018. Nothing here may be used without prior permission. Picture Window theme. Theme images by compassandcamera. Powered by Blogger.